The first week of classes is hardly a busy one, from an academic point of view of course, so the chances are that you will probably accept a free ticket to a concert if it’s offered. 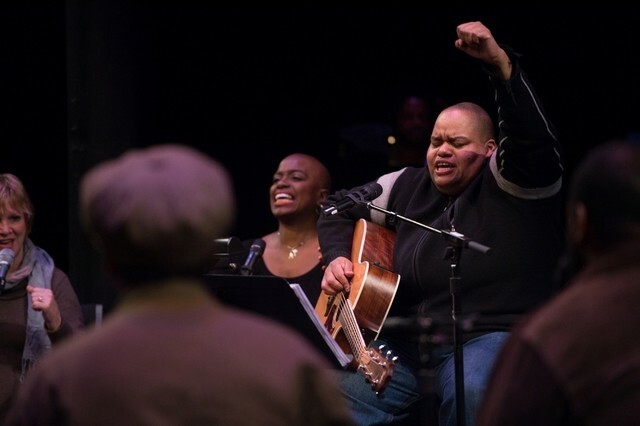 Even though I had not read Octavia E. Butler‘s Parable of the Sower and did not know much about Toshi Reagon’s concert edition of the novel, I took the ticket I was offered and went to the concert, held at the NYU Abu Dhabi Arts Center in early September. I had no expectations — and came out with all kinds of ideas rushing through my head. The American singer portrayed the novel’s ideas in her own musical language, which molded science fiction with African spiritualism. Lights out, complete silence, and then … nothing. For quite some time, the audience waited with anticipation for the performers to start playing. The orchestra started playing soft African music and the singers’ faces looked like forms of art. When Toshi made her appearance on stage, her voice swayed with cheer and the stage became vibrant; anticipation spread through the audience. I didn’t know the music — none of us did — but it felt familiar and warm, and intense. Among the singers, two women caught my attention: They were both tall, sitting sideways on chairs and facing each other, and had mesmerizing voices. Their posture and their slight smiles, which they managed to keep through the entire show, held hints of wisdom and passion. 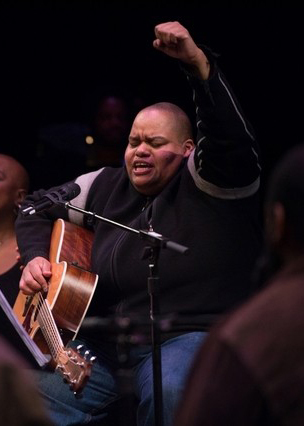 Because the opera was co-written by Toshi’s mother, Bernice Johnson Reagon, who founded the African American a cappella singing group Sweet Honey in the Rock, some of the songs reminded me of church songs that I’ve heard in movies. I’ve always found it intriguing how prayer can sometimes be best transmitted through music and dance, and the two women at the back of the circle of singers seemed sometimes to be leading the prayer songs. They looked like the care-takers of Toshi and the other singers. The women’s voices seemed to contain the other voices, bringing them to a communal revolt against what is happening to the world of Parable (and, perhaps, our own). The songs were my study-guide into the book. Each song turned a theme in the novel into a musical note that reached into the diverse audience. In one song, the stage roared with energy as Toshi raised questions that transformed the roar; she asked us what we would do to be safe, what compromises would we make? The lyrics painted a picture of utter violence and chaos in my head, which the mixture of voices brought to life. The show turned me to the subject of the novel: a girl who can feel other people’s pain and other sensations as if they her own. The songs of the concert allowed me, a member of the audience, the chance to role-play. Suddenly, like the novel’s heroine Lauren Olamina, I couldn’t formulate my definition of things like humanity, ethics, compassion, and other terms I thought I knew so well. These emotions of fear and worry, however, started me thinking. Maybe this quality is exactly what is needed in this world; maybe people need to feel the pain they’re inflicting on others, whether it’s direct or not, in order to stop all the awful things that have been going on. At least then the world might restore a form of its humanity. And although the humanity obtained this way may seem quite selfish, it’s still better than the reality we sadly live in. One song in particular brought out my memories of my personal loss, the painful experiences of my loved ones, and the sense of collective loss we feel when we wake up every day to heartbreaking news about the humanity slowly withering away from our world. This song, a solo entitled “Has Anyone Seen My Father” and sung by Shayna Small, was about loss, the inevitable part of life that leaves scars on all of us. The woman who sang stood alone in a spotlight, and the song was soft and slow, so that we could digest the words of confusion and pain that the singer brought to life. She was searching for her father, a hard-working preacher who had suddenly disappeared, and the words repeated, highlighting her sense of helplessness, fear, and despair. One of the final songs, my favorite, offered a powerful change of tone and emotion. Entitled “God is Change,” the singers stood and surrounded Toshi, as she moved from one place to another. They sang words that I wish a lot of the people in the world right now could hear. Mirroring the novel, the song promoted open-mindedness and adaptation, reminding us that religion is supposed to be guiding and kind, not binding and forceful. The song is a powerful message for all the people of the world to better understand their own religions. Change is good, and people can adapt to the changes of the world without giving up their spirituality. I walked out of the Arts Center with music in my ears and thoughts dancing around in my head, challenging the idea that only homework can get students to think when they’re outside class. Bertilla Baker, Helga Davis, Karma Mayet Johnson, Tamar-kali, Morley, Marcelle Davies Lashley, Josette Newsam-Marchak, Toshi Reagon, Carl Hancock Rux, Shayna Small, and Jason Walker. Musicians: Robert Burke, Fred Cash, Juliette Jones, and Adam Widoff.